One of Argentina´s most noteworthy dramatists and pioneer in psychodrama, Tato Pavlovsky passed away last night at the ripe age of 82. He viewed art as a way of provoking reflection on social issues. “An intellectual should be a sniper,” he once said. 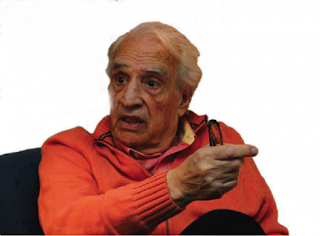 In November of 1974, while acting in his play “El Señor Galíndez” about the life of a torturer, a bomb went off in the Payró Theater, although he was not injured. Subsequently in 1977 the Military Dictatorship banned his play “Telarañas” and he had to flee to Uruguay, closely followed by death squads. He managed to seek refuge in Madrid. Indeed. Theater is vast in its expressive possibilities but as art it should never lose sight of its duty to question, investigate and explore independently of religious or political beliefs.